Computer Organization Lab 1 Soufiane berouel. 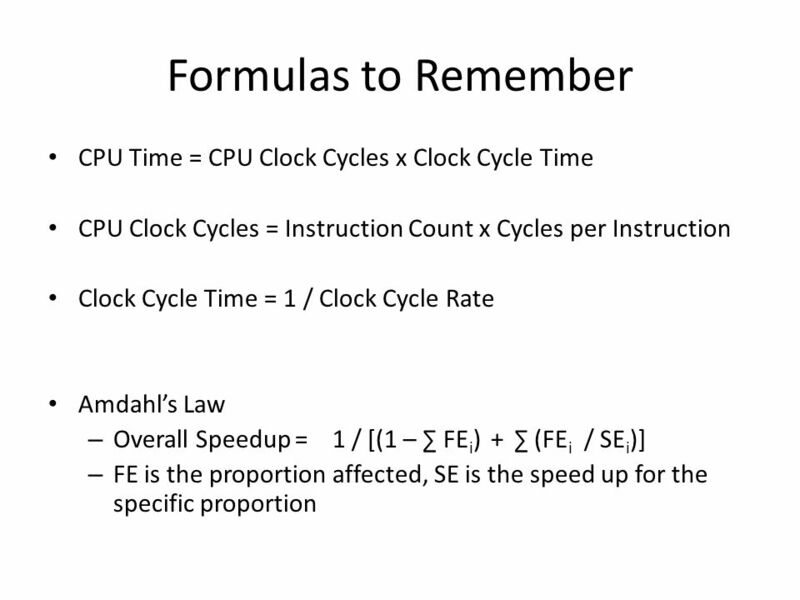 Formulas to Remember CPU Time = CPU Clock Cycles x Clock Cycle Time CPU Clock Cycles = Instruction Count. 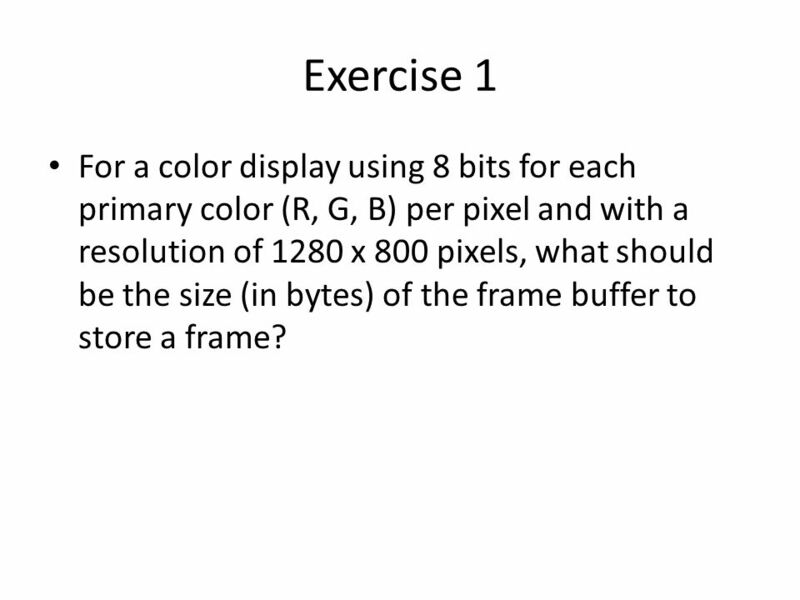 3 Exercise 1 For a color display using 8 bits for each primary color (R, G, B) per pixel and with a resolution of 1280 x 800 pixels, what should be the size (in bytes) of the frame buffer to store a frame? 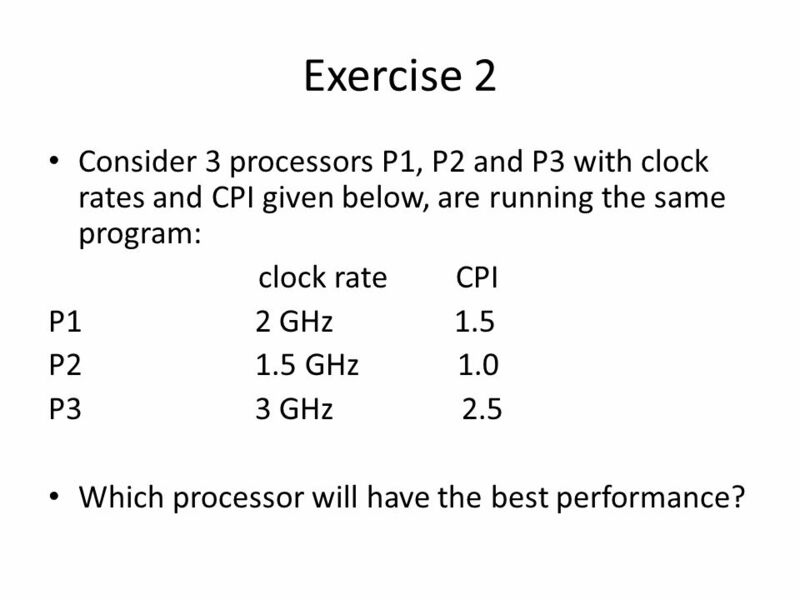 5 Exercise 2 Consider 3 processors P1, P2 and P3 with clock rates and CPI given below, are running the same program: clock rate CPI P1 2 GHz 1.5 P2 1.5 GHz 1.0 P3 3 GHz 2.5 Which processor will have the best performance? 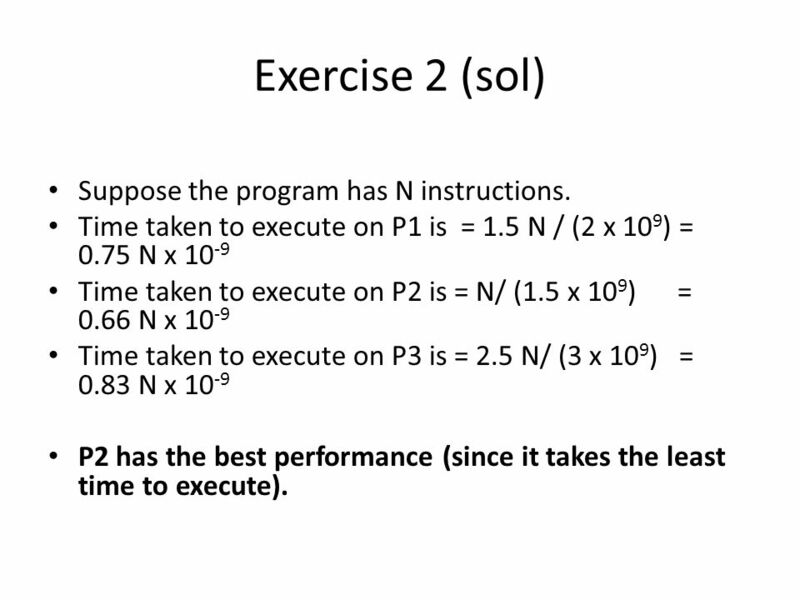 6 Exercise 2 (sol) Suppose the program has N instructions. Time taken to execute on P1 is = 1.5 N / (2 x 10 9 ) = 0.75 N x 10 -9 Time taken to execute on P2 is = N/ (1.5 x 10 9 ) = 0.66 N x 10 -9 Time taken to execute on P3 is = 2.5 N/ (3 x 10 9 ) = 0.83 N x 10 -9 P2 has the best performance (since it takes the least time to execute). 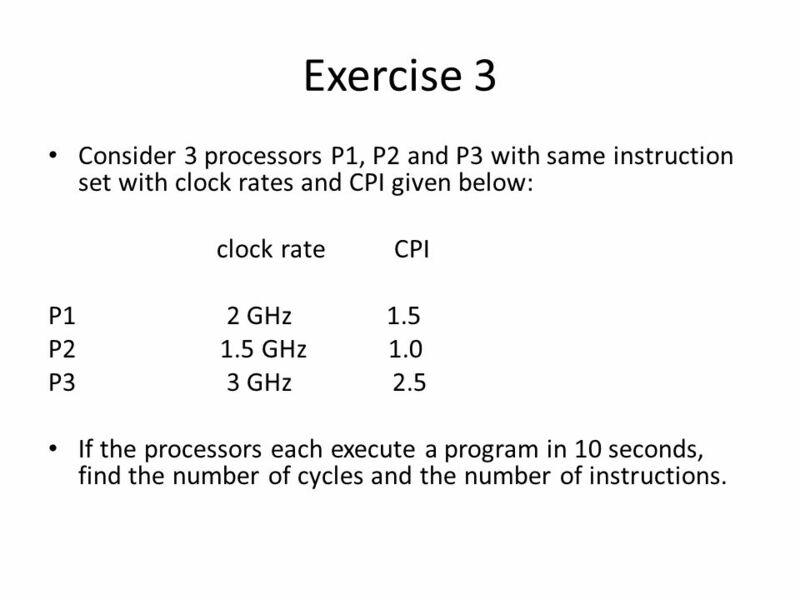 7 Exercise 3 Consider 3 processors P1, P2 and P3 with same instruction set with clock rates and CPI given below: clock rate CPI P1 2 GHz 1.5 P2 1.5 GHz 1.0 P3 3 GHz 2.5 If the processors each execute a program in 10 seconds, find the number of cycles and the number of instructions. 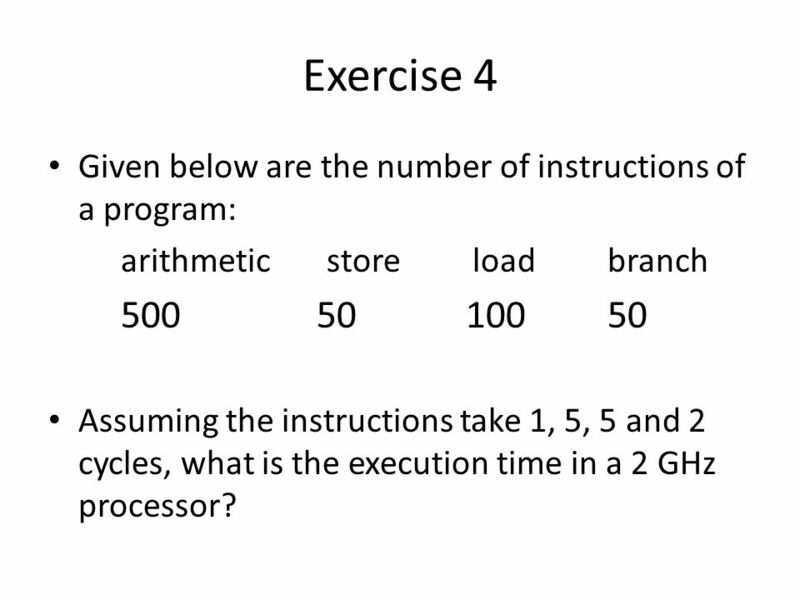 9 Exercise 4 Given below are the number of instructions of a program: arithmetic store load branch 500 50 100 50 Assuming the instructions take 1, 5, 5 and 2 cycles, what is the execution time in a 2 GHz processor? 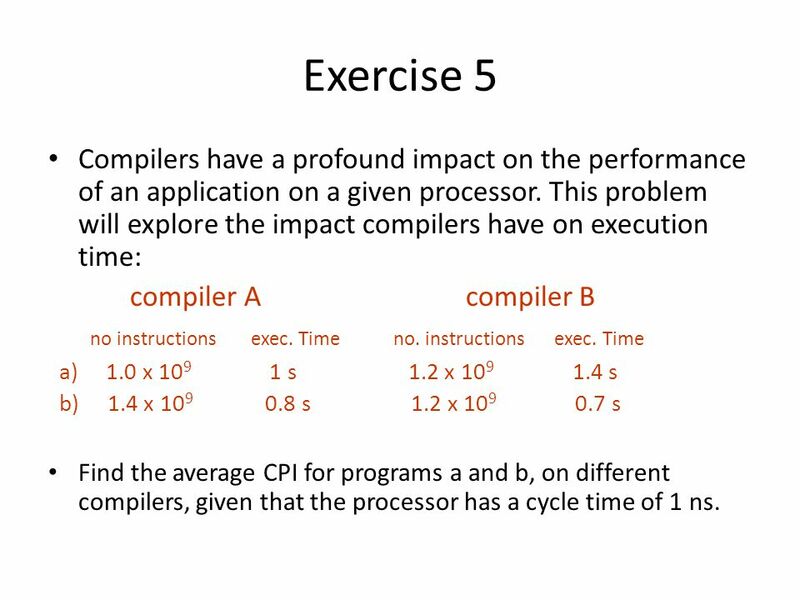 11 Exercise 5 Compilers have a profound impact on the performance of an application on a given processor. 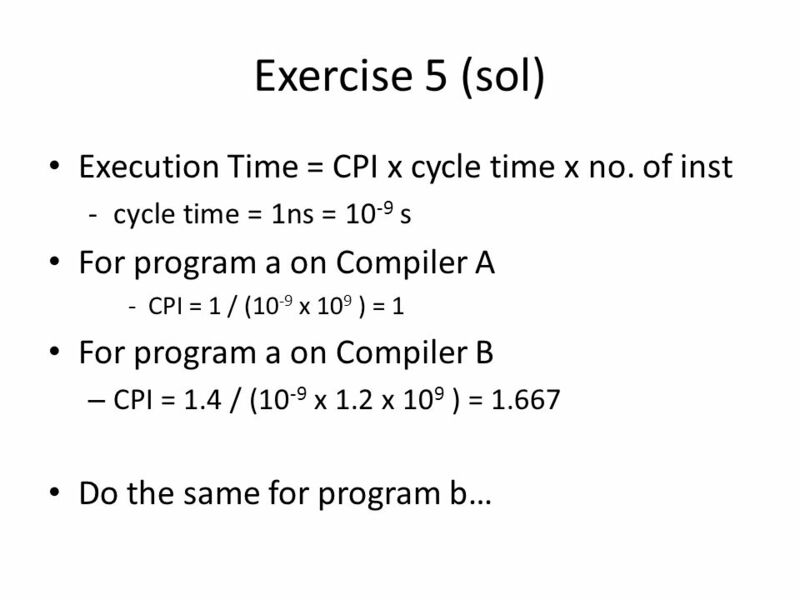 This problem will explore the impact compilers have on execution time: compiler A compiler B no instructions exec. Time no. instructions exec. Time a) 1.0 x 10 9 1 s 1.2 x 10 9 1.4 s b) 1.4 x 10 9 0.8 s 1.2 x 10 9 0.7 s Find the average CPI for programs a and b, on different compilers, given that the processor has a cycle time of 1 ns. 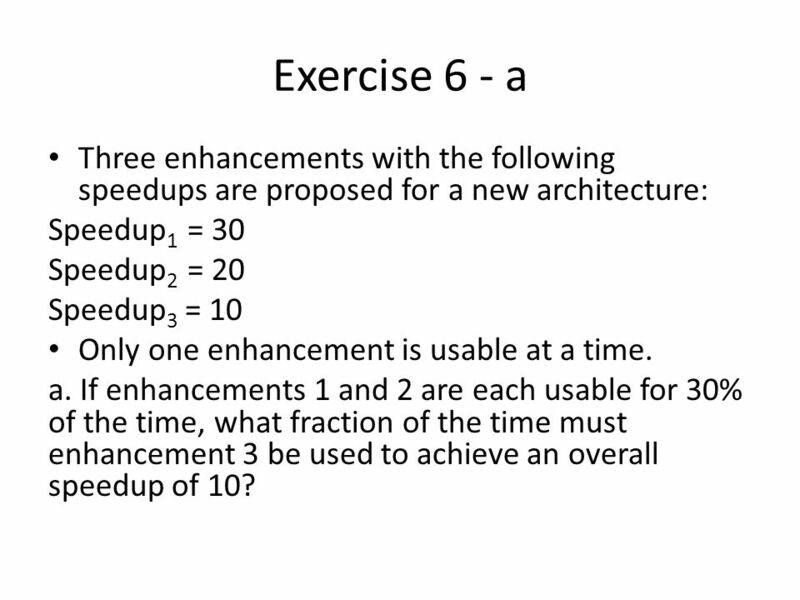 13 Exercise 6 - a Three enhancements with the following speedups are proposed for a new architecture: Speedup 1 = 30 Speedup 2 = 20 Speedup 3 = 10 Only one enhancement is usable at a time. a. 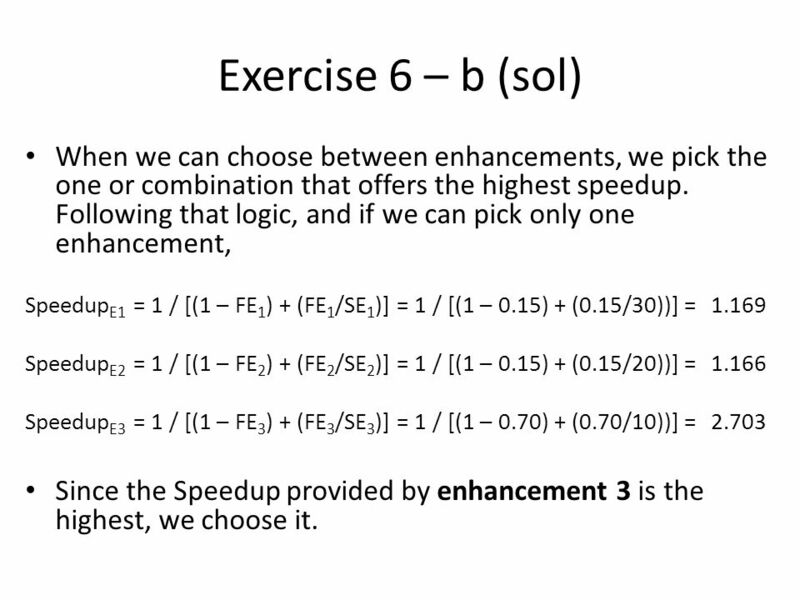 If enhancements 1 and 2 are each usable for 30% of the time, what fraction of the time must enhancement 3 be used to achieve an overall speedup of 10? 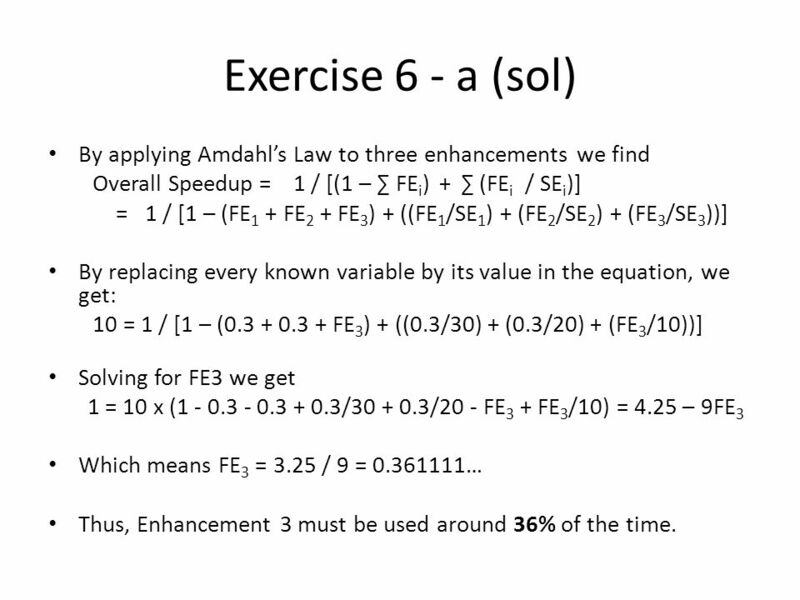 14 Exercise 6 - a (sol) By applying Amdahl’s Law to three enhancements we find Overall Speedup = 1 / [(1 – ∑ FE i ) + ∑ (FE i / SE i )] = 1 / [1 – (FE 1 + FE 2 + FE 3 ) + ((FE 1 /SE 1 ) + (FE 2 /SE 2 ) + (FE 3 /SE 3 ))] By replacing every known variable by its value in the equation, we get: 10 = 1 / [1 – (0.3 + 0.3 + FE 3 ) + ((0.3/30) + (0.3/20) + (FE 3 /10))] Solving for FE3 we get 1 = 10 x (1 - 0.3 - 0.3 + 0.3/30 + 0.3/20 - FE 3 + FE 3 /10) = 4.25 – 9FE 3 Which means FE 3 = 3.25 / 9 = 0.361111… Thus, Enhancement 3 must be used around 36% of the time. 15 Exercise 6 - b b. 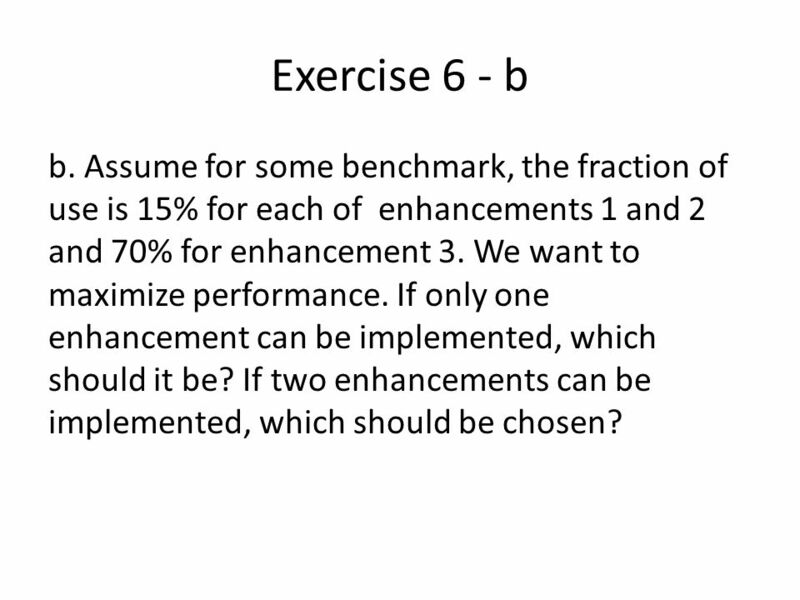 Assume for some benchmark, the fraction of use is 15% for each of enhancements 1 and 2 and 70% for enhancement 3. We want to maximize performance. If only one enhancement can be implemented, which should it be? If two enhancements can be implemented, which should be chosen? 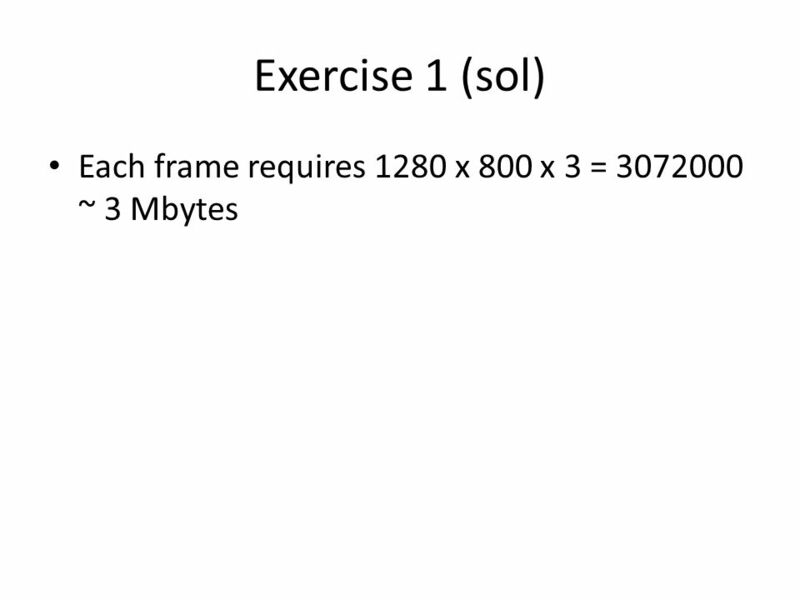 16 Exercise 6 – b (sol) When we can choose between enhancements, we pick the one or combination that offers the highest speedup. Following that logic, and if we can pick only one enhancement, Speedup E1 = 1 / [(1 – FE 1 ) + (FE 1 /SE 1 )] = 1 / [(1 – 0.15) + (0.15/30))] = 1.169 Speedup E2 = 1 / [(1 – FE 2 ) + (FE 2 /SE 2 )] = 1 / [(1 – 0.15) + (0.15/20))] = 1.166 Speedup E3 = 1 / [(1 – FE 3 ) + (FE 3 /SE 3 )] = 1 / [(1 – 0.70) + (0.70/10))] = 2.703 Since the Speedup provided by enhancement 3 is the highest, we choose it. 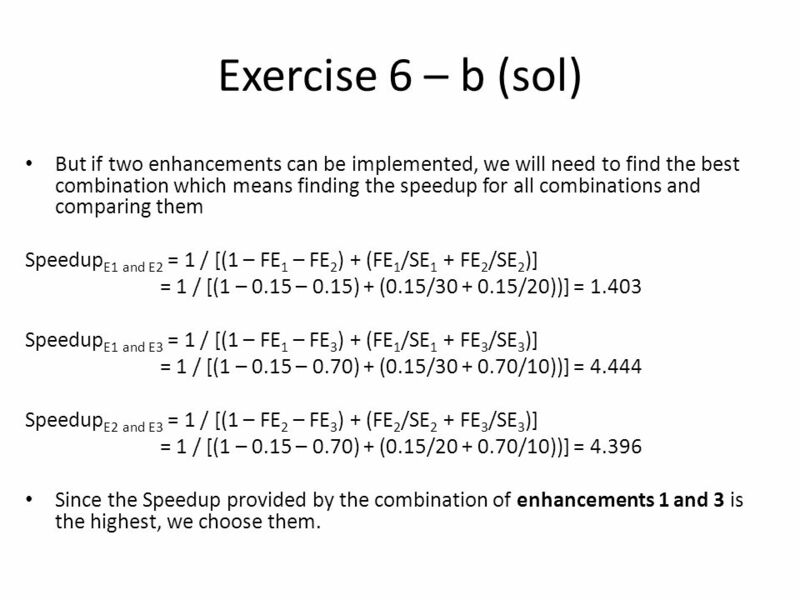 17 Exercise 6 – b (sol) But if two enhancements can be implemented, we will need to find the best combination which means finding the speedup for all combinations and comparing them Speedup E1 and E2 = 1 / [(1 – FE 1 – FE 2 ) + (FE 1 /SE 1 + FE 2 /SE 2 )] = 1 / [(1 – 0.15 – 0.15) + (0.15/30 + 0.15/20))] = 1.403 Speedup E1 and E3 = 1 / [(1 – FE 1 – FE 3 ) + (FE 1 /SE 1 + FE 3 /SE 3 )] = 1 / [(1 – 0.15 – 0.70) + (0.15/30 + 0.70/10))] = 4.444 Speedup E2 and E3 = 1 / [(1 – FE 2 – FE 3 ) + (FE 2 /SE 2 + FE 3 /SE 3 )] = 1 / [(1 – 0.15 – 0.70) + (0.15/20 + 0.70/10))] = 4.396 Since the Speedup provided by the combination of enhancements 1 and 3 is the highest, we choose them. 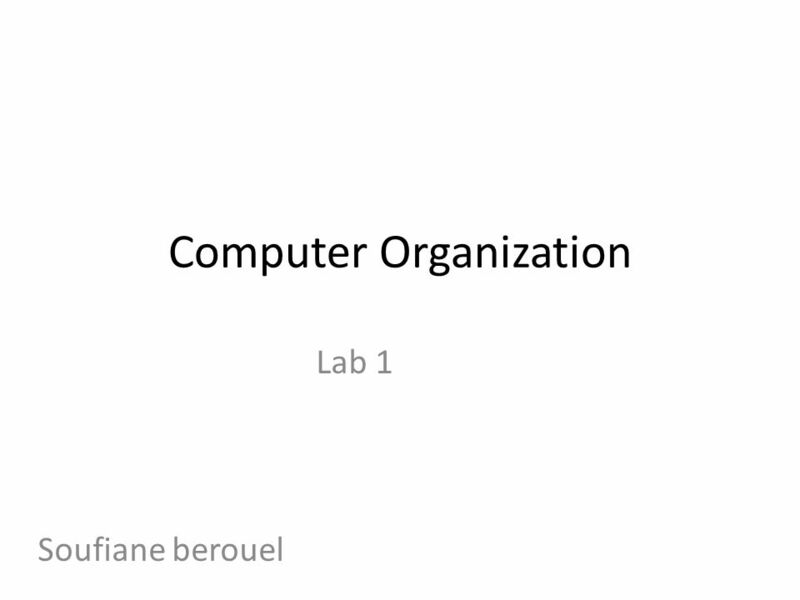 Download ppt "Computer Organization Lab 1 Soufiane berouel. 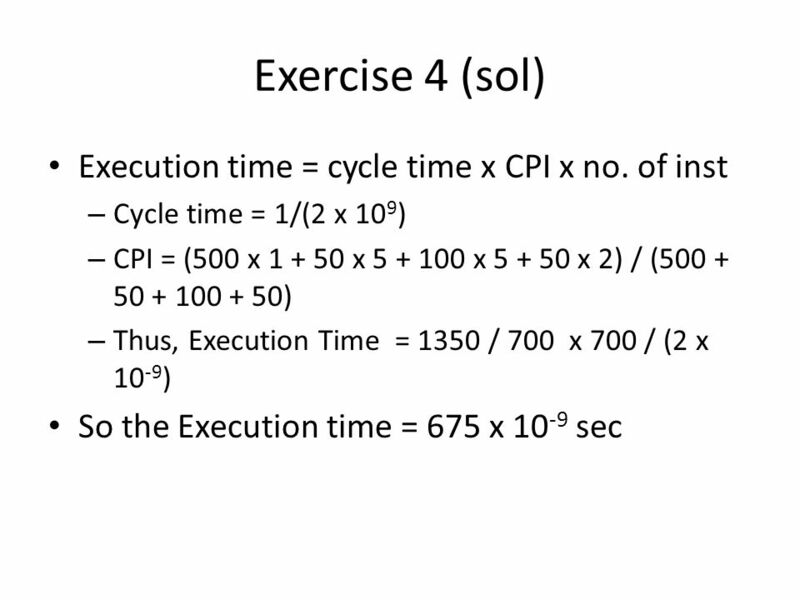 Formulas to Remember CPU Time = CPU Clock Cycles x Clock Cycle Time CPU Clock Cycles = Instruction Count." CMSC 611: Advanced Computer Architecture Performance Some material adapted from Mohamed Younis, UMBC CMSC 611 Spr 2003 course slides Some material adapted. Quiz 4 Solution. n Frequency = 2.5GHz, CLK = 0.4ns n CPI = 0.4, 30% loads and stores, n L1 hit =0, n L1-ICACHE : 2% miss rate, 32-byte blocks n L1-DCACHE. Performance What differences do we see in performance? Almost all computers operate correctly (within reason) Most computers implement useful operations. CS2100 Computer Organisation Performance (AY2014/2015) Semester 2. Understanding Performance Metrics of Processors Bina Ramamurthy Chapter 1. Performance Evaluation of Architectures Vittorio Zaccaria. TU/e Processor Design 5Z032 1 Processor Design 5Z032 The role of Performance Henk Corporaal Eindhoven University of Technology 2009. 100 Performance ENGR 3410 – Computer Architecture Mark L. Chang Fall 2006. Computer Organization and Architecture 18 th March, 2008. Example (1) Two computer systems have been tested using three benchmarks. Using the normalized ratio formula and the following tables below, find which. CSCE 212 Chapter 4: Assessing and Understanding Performance Instructor: Jason D. Bakos. 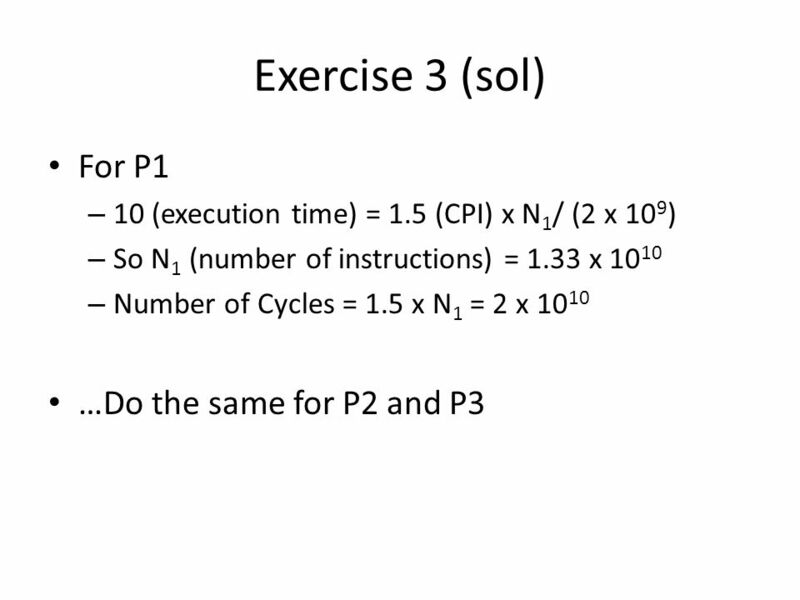 CIS429.S00: Lec3 - 1 CPU Time Analysis Terminology IC = instruction count = number of instructions in the program CPI = cycles per instruction (varies. ENGS 116 Lecture 21 Performance and Quantitative Principles Vincent H. Berk September 26 th, 2008 Reading for today: Chapter , Amdahl article. CSCE 212 Quiz 4 – 2/16/11 *Assume computes take 1 clock cycle, loads and stores take 10 cycles and branches take 4 cycles and that they are running on. CIS629 Fall Lecture Performance Overview Execution time is the best measure of performance: simple, intuitive, straightforward. Two important. Performance D. A. Patterson and J. L. Hennessey, Computer Organization & Design: The Hardware Software Interface, Morgan Kauffman, second edition 1998. September 10 Performance Read 3.1 through 3.4 for Wednesday Only 3 classes before 1 st Exam!